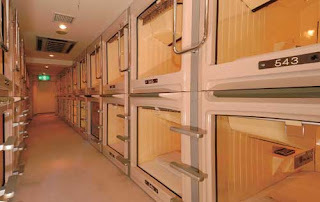 A capsule hotel (カプセルホテル) is a type of hotel in Japan with a large number of extremely small "rooms" (capsules) intended to provide cheap and basic overnight accommodation for guests not requiring the services offered by more conventional hotels. The guest space is reduced in size to a modular plastic or fiberglass block roughly 2 m by 1 m by 1.25 m, providing room to sleep. These capsules are stacked side by side and two units top to bottom, with steps providing access to the second level rooms. Luggage is stored in a locker. Privacy is ensured by a curtain or a fibreglass door at the open end of the capsule. 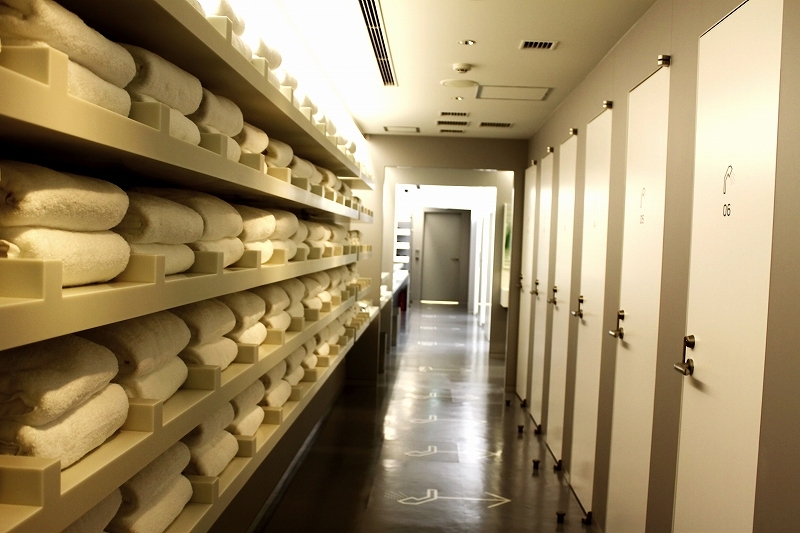 Each facility is provided with bed linens, a TV, an alarm clock, and often with slippers and a yukata gown (on entry). The hotel also has a public lavatory, shower room, smoking room and shared guest room. 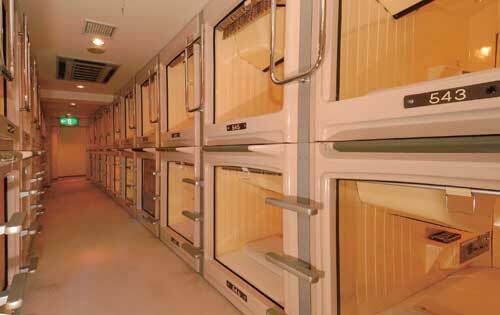 Capsule hotels are concentrated in major cities in Japan, and they are usually found in business district. The hotels are often used by Japanese male workers, but some hotels have separated floors for males and females. The benefits of capsule hotels are not only the cost, but also its central location. Here's a list of some capsule hotels in Tokyo. Over the past few years, capsules hotels are increasingly becoming stylish. 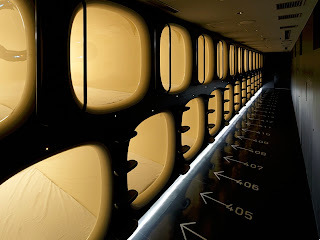 “9h” (9 hours) is a stylish capsule hotel in Kyoto, opened in December 2009. This hotel offers various high-quality services including reception,shower rooms, lounge, lockers, wash rooms and bed linens. They have separate elevators and floors for males and females. Capsule hotels are convenient. A capsule secures your privacy. If you want to save money on accommodation, I recommend you to stay at a capsule hotel.